Notes: This is probably the most popular fly designed by Sierran Flyfisher, Ralph Cutter, and introduced to the public in 1981. 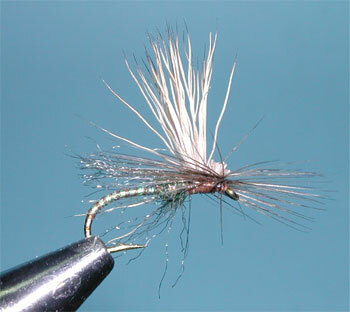 The E/C Caddis is an emergent/cripple caddis pattern developed for the large caddis hatches that frequent the Truckee River. At first, he tried to utilize a palmered body similar to the Elk Hair Caddis but noticed that the sillouette underwater was not similar to the naturals since the fly rode too high on the surface film. Ralph switched to a parachute wrap and utilized the Elk Hair wing as the wingpost. The fly rode deeper within the surface film and looked much closer to the naturals. Another important feature to this fly is the two-toned body which provides contrast and attraction. Ralph believes that the darker abdomen coloration creates an appearance of the shuck still encapsulating the lower part of the caddis body. The shuck consists of Z-lon material which absorbs water and allows the rear portion of the fly to sink within the surface film. The wing can be either Deer Hair or Elk Hair. Elk Hair will flare less than Deer hair and this can give the fly a better caddis profile but Deer Hair will have a better floatation and might be a better choice for faster moving waters. The most common colorations are Olive Brown/Caddis Green, Tan/Olive and Black. 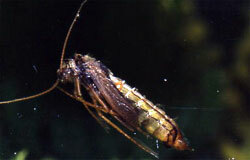 Since the E/C Caddis resides low in the surface film, it is often used on slow-moving waters. Ralph will apply floatant to the leader as well as the wing, thorax, and hackle to help with floatation on swifter waters. Since the fly is difficult to see an indicator is often usefull. The E/C Caddis has built a reputation as an excellent caddis pattern throughout the world and remains one of the best for the Sierras. 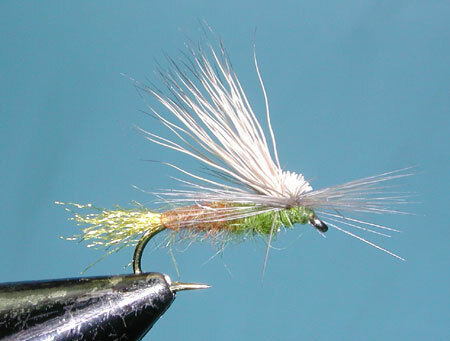 Colin (Sandy) Pittendrigh designed a pattern he called the Flat Caddis around the early 80's that places the hackle beneath the wing similar to the E/C Caddis. Colin created a "bodyless" variation that allows the wing to lay horizontally. 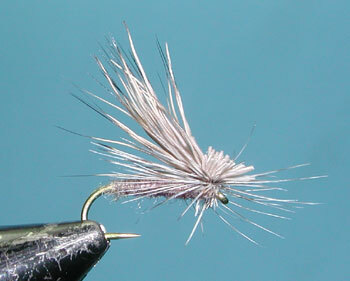 According to Colin, "Most tiers end up with a near-vertical wing, after winding the hackle. If you lash the wing on loosely, and then build up a bit of a thread post, below the wing, by winding thread horizontally--before winding the horizontal parachute--then you don't force the wing to stand up almost straight." Colin applies a micro-drop of Super Glue to the base of the wing to hold the loose wraps together after the hackle is wound. One variation to the E/C Caddis is the Hot Creek Caddis designed by Eric Otzinger while he worked at Bob Marriott's Fly Shop in the mid-90's. 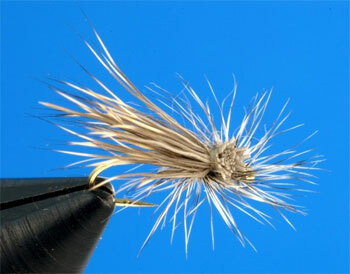 Eric's pattern is tied with a gray dubbing to represent the small gray sedge that frequents Hot Creek. His pattern is tied to smaller hook sizes of #16-22 and he leaves off any trailing shuck. 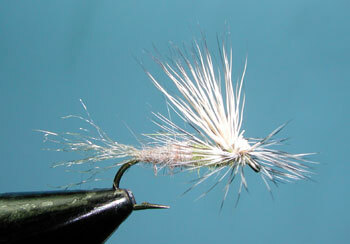 This makes the pattern a true dry fly, which is required to fish the Hot Creek Ranch private waters. The pattern has also been successfull on other slow-moving waters such as the Lower Owens. 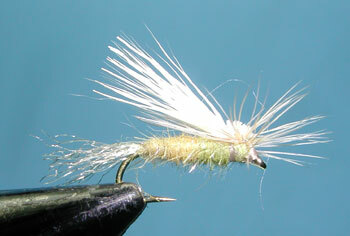 Another, more recent, variation is Mike Mercer's Missing Link Caddis. 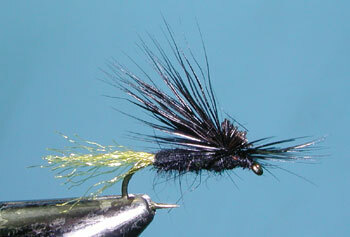 Mike introduced this pattern in the March 2010 of Fly Fisherman magazine. He experienced a situation where the fish selectively fed only on the dying or dead caddis adults after they released eggs. The rises where slow and regular. To represent a gaunt body, Mike tied a thread abdomen with a sparse flashabou rib and coated it with Softex. The spent wings were represented by zlon with a small dubbed ball of ice dubbing to keep the zlon strands from collapsing. The upright wing came from the E/C Caddis pattern and assists in seeing the fly as well as providing some additional floatation.